Died: July 22, 2010 in Operation Enduring Freedom. Unit: Marine Aircraft Group 39, 3rd Marine Aircraft Wing, I Marine Expeditionary Force, Camp Pendleton, Calif. 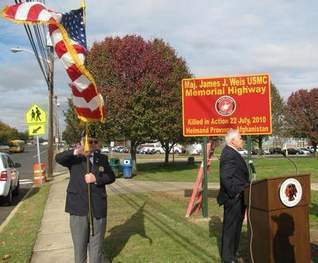 The Department of Defense has announced on Monday that Marine Major James M. Weis, 37, of Toms River, New Jersey died on July 22 while supporting combat operations in Helmand Province, Afghanistan. 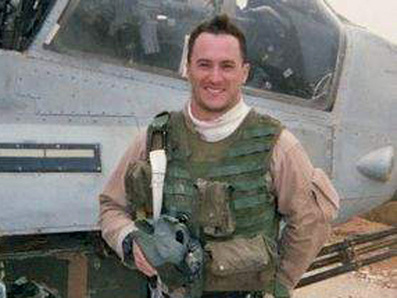 Weis was killed along with Lt. Col. Mario D. Carazo of Springfield, Ohio, when their Cobra attack helicopter crashed near Lashkar Gah, Helmand's provincial capital. The two were part of the Marine Aircraft Group 39, 3rd Marine Aircraft Wing, I Marine Expeditionary Force, Cobra squadron headquartered at Marine Corps Air Station Miramar in San Diego and based out of at Camp Pendleton. 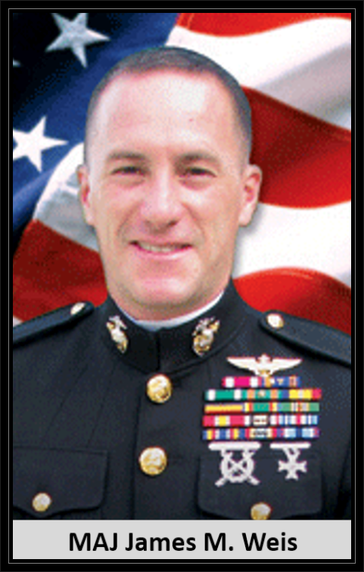 Major Weis joined the Marine Corps in 1994 and was a qualified helicopter pilot. 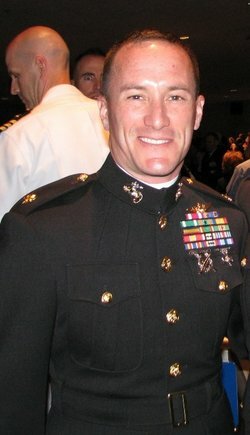 A highly decorated officer, Major Weis has been awarded the Meritorious Service Medal, an Afghanistan Campaign and four Iraq Campaign Medals, the Global War on Terrorism Expeditionary Medal, the Humanitarian Service Medal, and a Presidential Unit Citation-Navy, along with others. 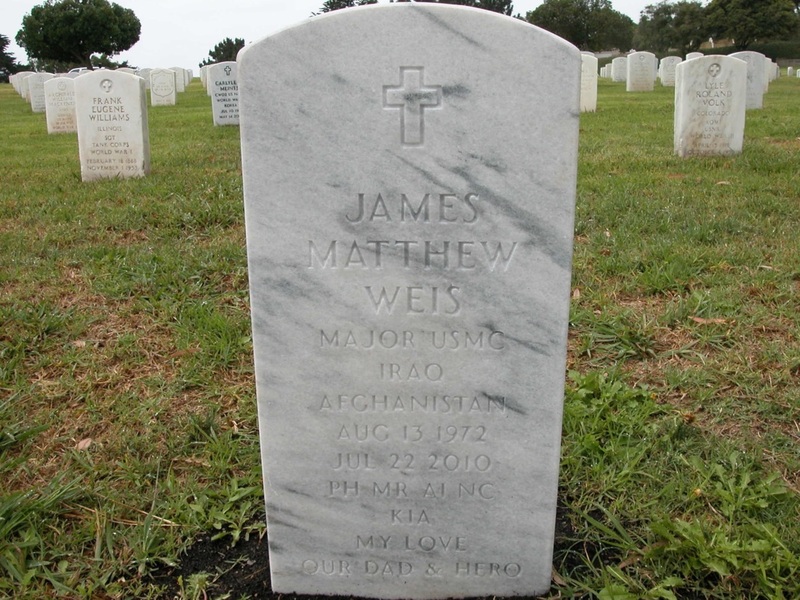 Major Weis had also served in Iraq and was part of the 2003 invasion. He is survived by his wife and two sons, his mother, and his brother who is also a major in the Marine Corps. His brother will be accompanying his body from Dover, Delaware to California. He will be buried in San Diego, California near the harbor where the Navy's ships come in. His mother stated that his funeral services would likely be Monday, August 2, 2010.
and a letter of appreciation. Lt. Col. Jeffrey C. Holt, the commanding officer of 3rd Battalion, 3rd Marine Regiment, and Lt. Col. Michael A. Moore, the commanding officer of Marine Light Attack Helicopter Squadron 369, move the memorial plaque of pilots Lt. Col. Mario D. Carazo and Maj. James M. Weis, into position on Forward Operating Base Geronimo's wall of the fallen during a plaque dedication ceremony, Nov. 7. The two pilots, from HMLA-369, were killed in action while supporting 3/3 combat operations in July. FORWARD OPERATING BASE GERONIMO, Afghanistan - Marines at Forward Operating Base Geronimo, Afghanistan, honored the sacrifice of two pilots from Marine Light Attack Helicopter Squadron 369 during a plaque dedication ceremony Nov. 7. The pilot team of Lt. Col. Mario D. Carazo and Maj. James M. Weis, known by their crew call sign of “Dealer 54,” were killed in action while supporting combat operations for 3rd Battalion, 3rd Marine Regiment, in July. Senior leadership from HMLA-369 flew to FOB Geronimo to attend the dedication ceremony where the pilots were remembered for their selfless support to the battalion before their memorial plaque was placed on Forward Operating Base Geronimo’s wall of the fallen. Dealer 54 had provided air support for 3/3 on several occasions before, to include the recovery mission of one of 3/3’s fallen Marines. When Dealer 54’s final flight ended in tragedy, the Marines they were providing close-air support for ceased their operation and ran nearly four miles in the desert’s summer heat to recover the downed pilots.